Canopy Labs, a company in the current class of startups incubated by Y Combinator, aims to help mid-sized businesses prioritize their sales leads and identify high-value customers. 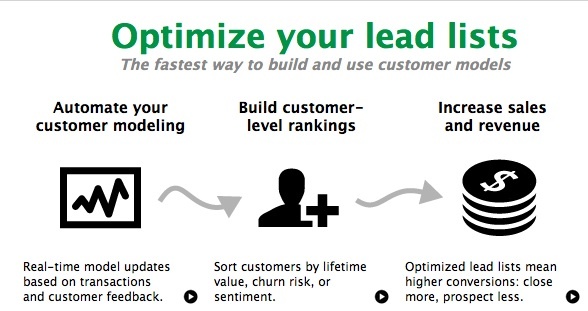 Co-founder and CEO Wojciech Gryc says that large enterprises usually hire outside consultants to build these kinds of lead optimization tools and customer models. Slightly smaller companies (namely, those that still have more than 10,000 customers) could still benefit, but they probably aren’t going to spend the money. Naturally, that’s where Canopy Labs comes in. Instead of paying to develop their own tools, mid-sized businesses can buy Canopy’s self-serve product, and while that might not be quite as good as a custom solution, Gryc argues that what these businesses really need is not “the most accurate, the best model ever built,” but rather something “actionable and quick” that’s usable by your average marketing analyst or sales analyst. Canopy Labs imports data from the services that a business is already using — email, e-commerce platforms, social media, voicemail, and call center recordings. Then Canopy uses its statistical models to rate customers in four main areas, namely risk (how likely they are to remain a customer), value (how much they’re likely to spend), sentiment, and engagement (how likely they are to communicate with or about the brand in some way). Canopy Labs customers can then use that data to prioritize their sales leads, or to customize their marketing messages to different types of customers. Gryc is a Rhodes Scholar who studied earned Master of Science degrees in Mathematical Modelling and Social Science of the Internet at Oxford. He also worked at McKinsey and at IBM Research. His co-founder and chief scientist Jorge Escobedo, meanwhile, recently earned a Ph.D. in Theoretical Physics from the University of Waterloo, and has done research on string theory. So it sounds like they’re tackling the problem with some real expertise and experience. The company’s product is still in private beta, but it claims to have already processed 3 million customers’ records, and it has already put up a few case studies on its website. In one sales campaign, Canopy claims to have increased conversions by 200 percent.